Gothic fresco mural painting "THE CONQUEST OF MAJORCA" 1285-1290. National Museum of Catalan Art, Barcelona, Spain, inv no: 071447-CJT. 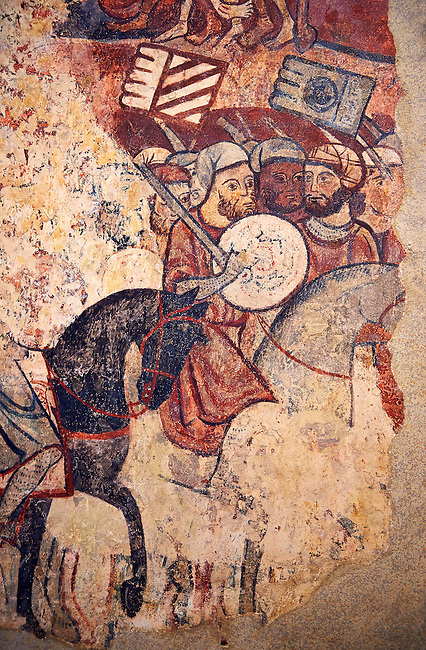 The mural paintings of the Conquest of Majorca come from the former ancestral home of the Caldes family in Carrer Montcada in Barcelona, a building later known as Palau Aguilar. Discovered and removed in 1961, these paintings are one of the most important examples of early or Linear Gothic Catalan painting. This magnificent example of painting on historical subject matter narrates the conquest of the island of Majorca by James I the Conqueror in 1229. Like a painted chronicle, the episodes follow the detailed narrative of Catalan medieval accounts such as King James I's 'Llibre dels Feits' and Bernat Desclot's 'Crònica'.